I don’t think I have a particular source or sources of inspiration beyond simply coming up with things I want to wear and/or things that fit a particular submission guideline. There are patterns that are utterly functional, that I made because I needed something to fit the bill, like my Hair Apparent pattern. But often, I’ll just start sketching a silhouette or detail that seems interesting and build off of that. 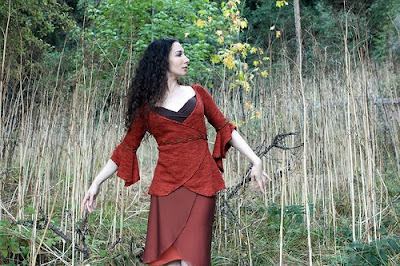 Frequently, I don’t know how all the details of a garment will turn out until I start working them. If pressed, I’d probably choose lace as my favorite technique, but, in reality, I like whatever is going to suit the project I’m working on. I’d say I am as much a process as product knitter and actually working stockinette, and cables, and color work and lace are all fun for me. I currently offer, in most of my patterns, about 12 sizes in 3”/7.5cm increments. It’s a constant challenge to offer a wide range of sizes without making the pattern so long and full of variables that it’s hard to follow. I chose my sizes based on the available standard measurements that I am able to find and what I hear from customers. For instance, there are very few patterns available for older children who are generally larger than the largest child size but not yet adult sized. Adding a few sizes that are a little smaller than the standard smallest adult size will generally fit these individuals. I’m not even sure how I could avoid looking at other designers’ work. I’m active on ravelry, many of my friends are designers, many more are active knitters, and I occasionally pitch in behind the scenes at Twist Collective, so I am always aware of things going on in the knitting community, even if I don’t intentionally seek out other designers’ work. But I don’t really see that as a problem. Unless one is designing really edgy art pieces that sacrifice functionality for form, it’s pretty hard to be completely original. Most designers are inspired by things they see on the street, in their closet, in movies, in books, and anywhere else clothing can be found. Designers may come up with unusual twists on one aspect of a garment, such as construction, or embellishment or stitch pattern, but the rest of the piece will often be some mix of standard design elements and shapes. This is not for lack of creative spirit but more a matter of keeping the finished product usable and wearable and flattering. I’ve heard this term used but never in any consistent way. One person might call a very elaborate and verbose pattern “dumbed down” because it spells out every step in order to avoid any confusion. Another might use this term to describe patterns that are intentionally as simple and easy as possible even at the expense of a better technique. For instance, someone may opt to have a person bind off and sew instead of graft a seam, because most beginners are going to find that method easier to do. Neither of these seem like a bad thing to me.The question probably comes down to customer expectations. There was a time in history when a knitter could figure out what the designer wants or how to do a technique, on her own or she could pen a letter to the publisher, and hope for a reply some weeks or months later. Designers were also limited by printing costs so many patterns became highly cryptic in order to fit the space provided. These days, a customer need only track down the designer on ravelry or email and they can have an answer, often within a day. And with PDF downloads, designers have unlimited space to include whatever information might be useful. While this puts a greater onus on designers for support, it’s also the reason why designers are able to self publish and some even make a decent living at it. In the end, I see no controversy. I make my patterns as detailed and complete as possible but I also happily include techniques that may be out of the skill set of some of my potential customers. My goal is to address as many questions as I can in the pattern so there are fewer reasons for customers to contact me and I’m always careful to outline exactly what people need to know before buying a pattern. That may seem “dumbed down” in comparison to patterns that were published in the 1930s but I also suspect my customers find it easier to get the expected results. At this point, I do everything myself. I do hire tech editors to review my patterns before publishing, but the rest I do myself. I think there’s a trade-off to hiring a sample knitter to work up a pattern you have never knit. On the one hand, it’s a great way to get an initial dry run on your pattern, but on the other hand, you’ve lost the opportunity to improve the pattern as you work it yourself. I sometimes plan my entire pattern before the swatch has dried, and make absolutely no modifications as I go, but this is very rare. I feel like I would lose a certain part of the design process if I didn’t knit the piece at least once.As for testing knitters, while I would love to be able to have everything test knit in several sizes, I feel strongly that I shouldn’t hire anyone to do work for me whom I cannot pay. Until I have a bigger budget, I do without test knitters, despite the many generous offers I get from people willing to do so for free. So far, designing is only a side job and while I take it very seriously, I don’t have any formal business plan in place. In truth, I’m a little worried that I’d realize just how poorly this job really pays me per hour, and that might be a little discouraging. That’s not a good reason to fore go a business plan but that’s one of the things that holds me back. I never had a mentor and honestly, I don’t learn as well working with a mentor as I do studying things on my own. One of the reasons I post so many tutorials on how I’ve come to do things is because I wished that sort of information had been available to me when I was learning and I hope that others will find it useful as well. 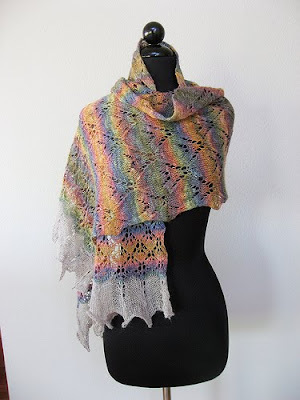 While I occasionally publish in books I work almost exclusively on patterns that are sold via the Internet, either through self publishing or through online knitting magazines. I feel very strongly that had I started designing before the Internet, I would never have become a designer. With no formal design training and having never knit a piece from a pattern, I had a lot to learn about grading and writing that simply would not have happened had I simply tried to submit to a print magazine. It would have been terribly discouraging for me to submit, wait for a response, and possibly face a long string of rejections. And even had I received an acceptance I might possibly have to work with an unfamiliar yarn on a tight deadline. I just don’t know that I would have ever built the skills needed to make that a fun prospect. Yes, though this was a lesson hard learned. If money and time were no object, I would redo all my old free patterns, standardizing them and having them professionally tech edited, but even if the patterns are very inexpensive to edit, time and money spent reworking those patterns, will never generate any additional revenue so they remain forever at the bottom of the queue. I’m very careful not to over commit myself, which leaves me flexibility to consider last minute opportunities and time to knit for fun or for self-publication. Generally, I’ll take on no more than one or two designs per season, which means I’m not as prolific as many of my peers but I avoid burn out. I’m your classic people pleaser and even on my best days, criticism can get me down a little but I value it as a learning opportunity as well. No one is perfect and mistakes happen. Criticism is what led me to make tech editing a regular part of the designing process. Criticism has helped me realize that greater size support within my patterns is important. Criticism has helped me to better standardize my patterns and improve my photography and pattern layouts. I’m lucky that I have friends who design as well and who I can use as a sounding board. They will root me on when I’m feeling down but also gently urge me to consider useful feedback and implement it. I don’t design full time and having just done my taxes; I can assure you that I won’t be quitting my day job any time soon. I love knitting and I love designing and while there’s something to be said for doing what you love, I wonder if I would love knitting less if I were always trying to crank out one more design so I could pay the mortgage. I’m not dismissing the idea out of hand, but I love my other job and it’s nice to be able to take a breather from knitting if I need to. Designing, as a career, is a lot like gardening. You do a lot of work up front that may take a long time to show and if you haven’t done it before, there are a lot of variables and chances for mistakes, but what you do when you are planting those first seeds will impact you down the line. Giving away your hard work, being rude to customers, failing to meet deadlines or not communicating with publishers, will all have an impact on you as your business grows. Luckily, there are some great online resources and mentoring programs available. Try to take advantage of any of them that you can, ask questions and be open to feedback. There are no universal rules and most problems and mistakes can be addressed but if you strive to be professional even before you feel professional, you’ll serve yourself well, make the process less stressful and set a solid foundation for years of designing in the future. Marnie is definitely cool! She uses Excel to design patterns! That's probably the best use of any Microsoft product! Marnie rocks! Marnie's patterns show a wonderful understanding of what looks flattering on the body. The fact that she can design for such a wide range of sizes and achieve that is really impressive. What's most impressive, however, is her sense of whimsy. Just looking at her dragon hoodie for babies or her Le Monstre hat can take the grey out of any ugly workday.